To make it easy to navigate our online library is segmented according to the spare parts management life cycle, as shown in the diagram below. of videos, white papers, articles, podcasts, and presentations relating to that subject area. The spare parts management system guides the activity and decision making throughout the life cycle of the spare parts held in inventory. It is vital that the people engaged in establishing this system understand spare parts management, not just supply chain or generic inventory management. The two most important decisions in spare parts inventory management are whether or not to stock an item and how many to stock. It is these decisions that determine if you have the stock that you need and how much money you spend on your inventory. It is in this phase of the life cycle that a company has the greatest influence on its spare parts inventory, and getting these questions “right” for your circumstance makes everything else that follows that much easier (but not necessarily easy!). 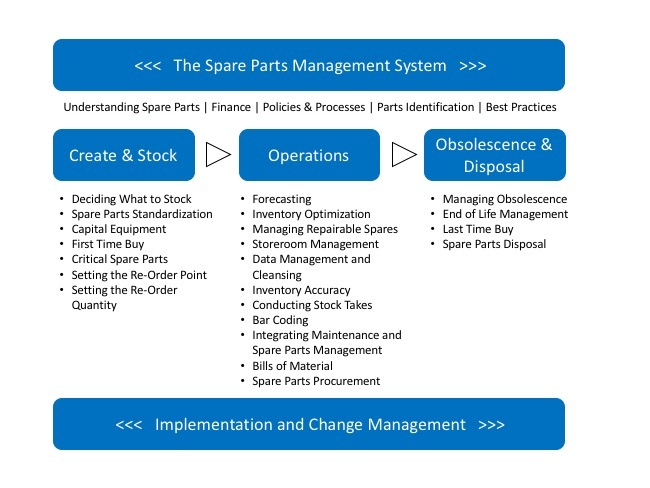 Following the create and stock phase, the longest part of the spare parts life cycle is the operations phase. While the decision to create an item and stock it in the inventory may be made in minutes, the item can then be part of the inventory for years or even decades. During this time, for most spare parts, the item (and the storeroom team) can be involved in a huge range of activities. Accordingly, this is the largest section of our library. No matter how an item was first created or how long it is part of an inventory, it is almost inevitable that at some point it will become obsolete and therefore require removal and disposal. This section addresses the final phase of the life cycle by discussing end-of-life management, the last-time buy, the management of obsolescence, and the options for spare parts disposal. Spare parts inventory management involves a wide range of personnel and there is often frequent ‘changing of the guard’. Therefore it is important that spare parts managers understand the issues and requirements relating to implementation and change management.